This humble pdf clocks in at 5 pages, 1 page of which is devoted to the front cover, leaving us with 4 pages of content, designed by James Sutter with Jonathan Weisnewski and Jonathan G. Nelson. Wait…yep, the same James Sutter who happens to be Starfinder’s creative lead! The second weapon similarly gets a nice prose section that helps make it stand out – this time around, that would be the RD implosion grenade, which comes in 5 different versions: The basic one is a level 1 grenade for 120 credits, while the fifth version is a level 18 grenade, lovingly known as “Black Hole”: These explode in a blast radius, and then such targets towards the grid intersection where it detonated. A save negates this, and distance depends on the item’s version. Really cool! An overheard conversation introduces us to the grapnel harpoon, which comes in 4 different versions, ranging from item level 2 to 14, with damage ranging from 1d6 P to 5d4 P. When you successfully damage a target, you have established a connection to the being, and then may activate the harpoon as a move action. You make an opposed Strength check with a +4 bonus. (Shouldn’t that be an insight bonus?) On a success, the creature is roped towards the closest unoccupied square adjacent to your, being drawn to you in a straight line. If you fail by 5 or more, you can end up being disarmed or be moved towards the creature. The weapon can only harpoon one target at a given time. Reactive panels come in three Mks, (level 6, 8 and 10), occupy 2 slots and may be installed in heavy and powered armor. These grant you a number of temporary Hit Points that apply only to the three physical damage types (bludgeoning, piercing, slashing). Additionally, all creatures adjacent to you, must make a Reflex saving throw or take the same amount of damage as that prevent by these temporary hit points. Once the panels are depleted, they require 1 minute to recharge, taking up one of the charges. The temporary hit points budget ranges from 5 Hit Points to 15. Usage is 5, though, so yeah, these are battery guzzlers… Plates have 1 Bulk. Editing and formatting are top-notch, I didn’t notice any glitches on a formal or rules-language level. Layout adheres to a two-column full-color standard, and the pdf sports one amazing, original full-color artwork for every weapon – kudos! The pdf has no bookmarks, but needs none at this length. Fun piece of trivia: All of the folks involved are musicians as well! Jonathan Weisnewski is the gunsmith for the Destiny franchise and is responsible for vocals and guitar for the band Sandrider. (Pretty kickass, imho! ); Jonathan G. Nelson’s band is “A Different Breed of Men”, where he is responsible for drums and vocals, and James Sutter plays guitar and sings for “Brides of the Lizard God.” And yes, these are well worth checking out! But I digress! 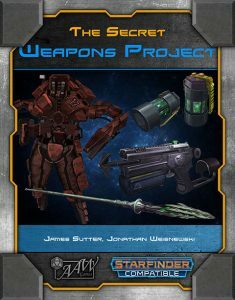 This humble pdf’s weapons have in common that the well-crafted prose renders them more than just a collection of stats – and that each and every one of them does something unique that no other weapon does! Combined with the amazing artworks, we get a sweet little pdf of all killer, no filler weaponry. Totally worth 5 stars + seal of approval! You can get these cool weapons here on OBS!